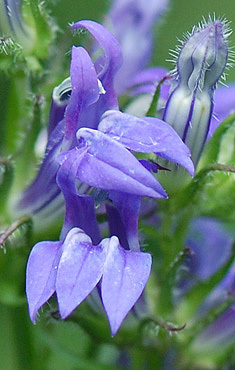 Great Blue Lobelia, Lobelia siphilitica L.
Lobelias have a tubular shape corolla splitting into 2-lipped flowers with a 2-lobed upper lip and a 3-lobed lower lip. Great Blue Lobelia is a native erect perennial growing from 1 to 4 feet high on stems that seldom branch below the inflorescence. Stems are stout and either smooth or with sparse fine hair, but usually with hair in the inflorescence. 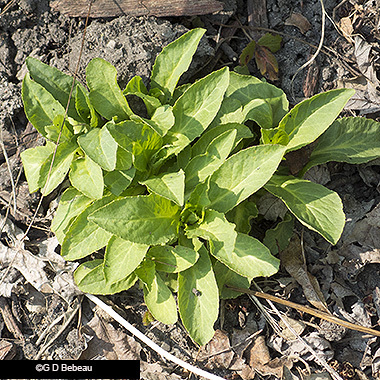 Leaves are alternate, oblong to oval, (broader than those of the Cardinal Flower) and tapering to a stalkless base in the uppers while some lower leaves may have a short stalk. 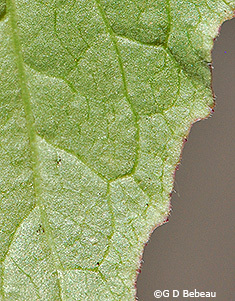 Leaf margins can be entire but usually have a broadly toothed edge. Surfaces are usually smooth, without hair, the underside a paler color than the upper side. A basal rosette is first seen in the Spring. The inflorescence is a crowded raceme, 4 - 12 inches tall, of stalked flowers, the spike rising above the leaves. Flowers: The 5-parted flowers of this plant are about 1 inch long with hairy stalks. The green calyx is very hairy and has 5 pointed long lobes. The corolla tube is bluish-purple, inflated and with darker color nerves underneath. (White albinos are known to occur.) The tube opens to an upper lip with 2 lobes and a lower lip with 3 lobes, all of which have pointed tips and are deeply split between the lobes. Five stamens are united around the style and rise up between the upper lips and then make an abrupt downward turn near the tips. A green leaf-like bract is subtended to each flower. (see Eloise Butler's notes below). L. siphilitica is gynodioecious, that is a certain percentage of plants will have sterile male parts and are thus female only. These plants can be determined by papery white anther tubes which are without pollen instead of bluish ones. Seed: At maturity hundreds of oblong, ribbed, brown seeds form in a 2-celled capsule, that opens at the top. Seeds require 60 days of cold stratification and require light for germination. Seeds collected in the fall can be planted immediately and let nature do the work. Varieities: Two varieties of L. siphilitica are found in Minnesota: Var. ludoviciana and var. siphilitica. The former is considered a western version in North America with less hair, leaves up to 3/4 inch wide and mostly hairless and fewer flowers. The latter is shown here in the photos, and is considered an eastern variety that has hair on the flowers and in the inflorescence, wider leaves and more flowers. According to the DNR plant surveys there is overlap in their ranges and both varieties are found in a number of metro area counties. 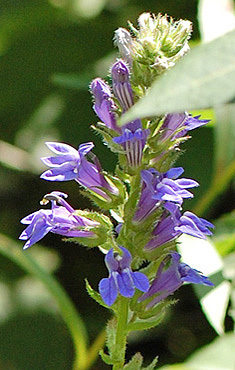 Habitat: Great Blue Lobelia grows from a rhizomatous root system. Separating and planting the basal rosettes of mature plants will also produce new plants. These grow from the plant's rhizomes and separation can be done fall or spring. Stem cuttings can also be propagated. All together, a versatile plant to grow. Like the Cardinal flower, this Lobelia prefers a wet to moist soil and full to partial sun. Names: The genus Lobelia is named after the Flemish botanist Matthias de l'Obel (1538-1616), who, when he moved to England as physician to James I, anglicized his name to Matthew Lobel, hence "lobelia." The species siphilitica, is a reference to the old folk medicine belief that extracts made from the plant could cure syphilis. The author name for the plant classification - 'L.' is for Carl Linnaeus (1707-1778), Swedish botanist and the developer of the binomial nomenclature of modern taxonomy. The family name for this plant is changing based on the work of the Angiosperm Phylogeny Group; many sources, including Minnesota authorities at the U of M Herbarium, now list this plant in the Lobeliaceae family whereas USDA still maintains it in the Bellflower family (Campanulaceae). Comparisons: On the five species of Lobelia found in Minnesota, none of the others are likely to be confused with the dense spike of blue flowers and the dense leaves of this species. The other species located in the Garden is the Cardinal Flower, L. cardinalis. Above: The inflorescence is a tall raceme atop the stem. Flowers have a hairy calyx, distinctly veined, with the corolla tube splitting into a 2-lobed upper lip and a 3-lobed lower lip. Below: 1st photo - Detail of the pistil with the surrounding closed ring of the united stamens. 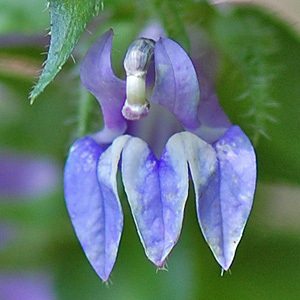 Note the bluish color of the anther tubes around the style, indicating a bisexual flower. 2nd photo - Leaves are toothed, oblong to ovate and alternate on the stem. 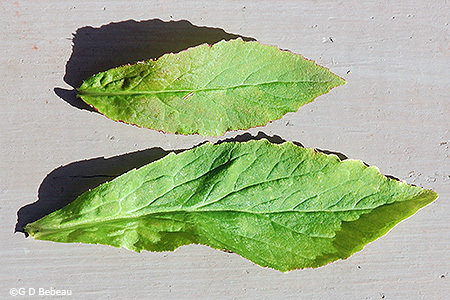 Below: 1st photo - Leaves are tapering to a stalkless base in the uppers (top leaf) while some lower leaves may have a short stalk (bottom leaf). Leaf margins can be entire but usually have a toothed edge. Surfaces are usually smooth, without hair, the underside (2nd photo) is a paler color than the upper side. Below: 1st photo - Note the dark nerve lines on the underside of the flower tubes. 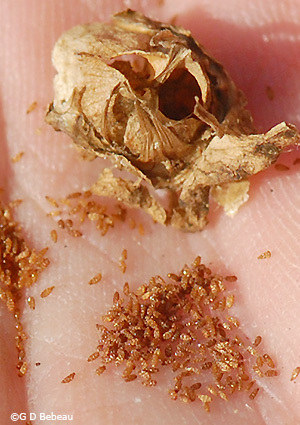 2nd photo - The two-chambered seed capsule is filled with 100+ oval, ribbed, light brown seeds. Below: The basal rosette in Spring. These can be divided Spring or Fall. 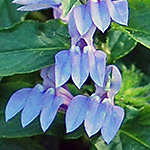 Notes: Great Blue Lobelia is indigenous to the Garden area. Eloise Butler catalogued it on Sept. 6, 1907. She planted additional plants in Sept. 1909 with plants brought in from Needham, MA. In 1918 she planted others, including on Aug. 1918, a white one obtained from the Golf Grounds of Glenwood Park. Martha Crone reported gathering a plant in Anoka and planting it near the Mallard Pool on June 23 and July 3, 1933 and planted more in 1946 and '47. It is native to much of Minnesota except counties in the northern part. 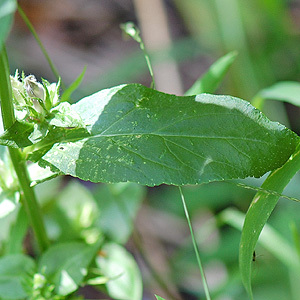 There are 5 Lobelia species found in the wild in Minnesota: This species plus L. cardinalis, Cardinal Flower; L. inflata, Indian-tobacco; L. kalmii, Ontario lobelia; L. spicata, Pale-spike Lobelia, and L. dortmanna, Dortmann's Cardinal Flower. Eloise Butler wrote of the plant: "High above the lovely Grass-of-Parnassus rise the spikes of tall lobelia in such opulence that the meadows appear to be gemmed with lapis lazuli rimmed with goldenrod. The tubular portion of lobelia flowers is split down to the base for the convenience of the nectar-seeking insects, and the stamens, five in number, are united in a closed ring around the pistil so that, to the novice, stamens and pistil seem to be a single body. 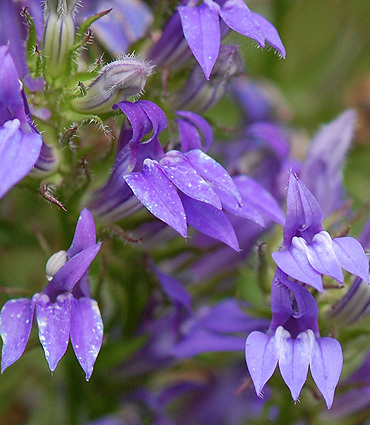 The Lobelias may be recognized, whatever their size or color, by these peculiarities." Published Sept. 3, 1911, Minneapolis Sunday Tribune. Lore: There are brief references in the literature to Native American use of this plant for medicinal purposes, principally using the root and principally using Lobelia as an additive in preparing herbal medicine treatments from other primary plants. In European homoeopathy, the root of the plant was said to be a diaphoretic, and emetic and a cathartic, used for dropsy, diarrhoea, syphilis and dysentery. (Ref. #7).